I changed the title and URL of my blog. Unfortunately, It didn't carry over my followers. Here is the new blog. Please go there and being following to continue the journey with me! The title of this entry is a little morbid, but I am confronting a feeling I never expected to feel: could I actually like Katharine Hepburn?!?!?! If you are a fellow Ginger fan and have read her autobiography (if you haven't, what's wrong with you? ), then you know that Ginger and Kate did not get along famously. Ginger recalls that Kate once poured a glass of water out of a two-story window on to her brand new coat, claiming that "if it's real, it won't curl". According to some reports she also slandered Kitty Foyle after Ginger took home the 1940 best actress Oscar, claiming "I and every other girl in Hollywood turned down that filth". In reality, can I dislike Katharine Hepburn for saying a few rude things to my favorite person? It's an irrational conclusion to jump to. Another irrational thought is the one that Ginger was totally innocent and did not warrant any of these comments or actions. Like all actors, Ginger was pretty full of herself. Kate was too, and they were competitors for the non-existent title "Queen of RKO". While Kate garnered awards, Ginger was raking in the dough with her musicals and side projects. They were (understandably) jealous of each others' positions. Ginger longed to be taken seriously as an actress, and Kate didn't want to be shoved out of the business for being "Box Office Poison" (she was voted #1 box office poison in 1937 or 38). 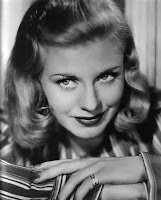 My point is: Ginger Rogers and Katharine Hepburn were both human beings, and so am I. We can't all agree on everything: there are plenty of things about Ginger that I don't like, so why should I shun Kate's entire career for being a little mean every once in a while? Reluctant as she was, Kate was a great comedian. These are the pieces of her career that I really enjoy. It began with Stage Door. I have read that Kate threw quite the fit over her second billing. 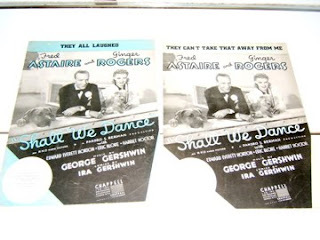 In her autobiography she states that after hearing comments from preview audiences, her billing "was restored to its proper place", ie side-by-side. I admire Kate's spirit and attitude toward life. She was a fighter, but not in a belligerent way. In a couple of weeks, I will return to the topic of Ginger and Kate. They have interesting career parallels that deserve further exploration. I had the great pleasure of attending the special HD presentation of "The Wizard of Oz" on Wednesday. What a wonderful way to spend an evening. I skipped a class (My Writing about Film screening of "Away From Her"). It was definitely worth it. The film opened with a brief introduction by our favorite spokesman Robert Osborne, followed by a short documentary about the production. It wasn't terribly detailed for a classic film fan, but the less-devoted people around me seemed interested in it. I did enjoy the stock footage of Margaret Hamilton describing her casting as the witch. She seemed like a hoot. The film was spectacular. I got a little misty-eyed when the opening credits began to roll. I couldn't stop thinking about how lucky 1939 audiences were to be able to see this for the first time on the big screen. There were things I had never noticed before-the details in Munchkinland and Oz especially. 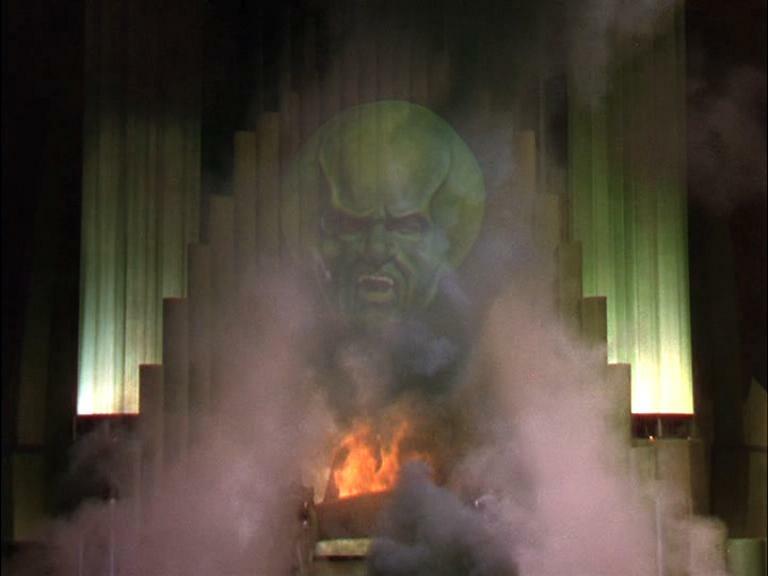 Things I never saw on the 27-inch TV that first presented me with this film in my childhood. Even though I have never known a world without color images, the transition from sepia to color was mesmerizing, like a whole new world was being opened up to me. Another thing I realized during the film was that I had never seen it the whole way through in one sitting! 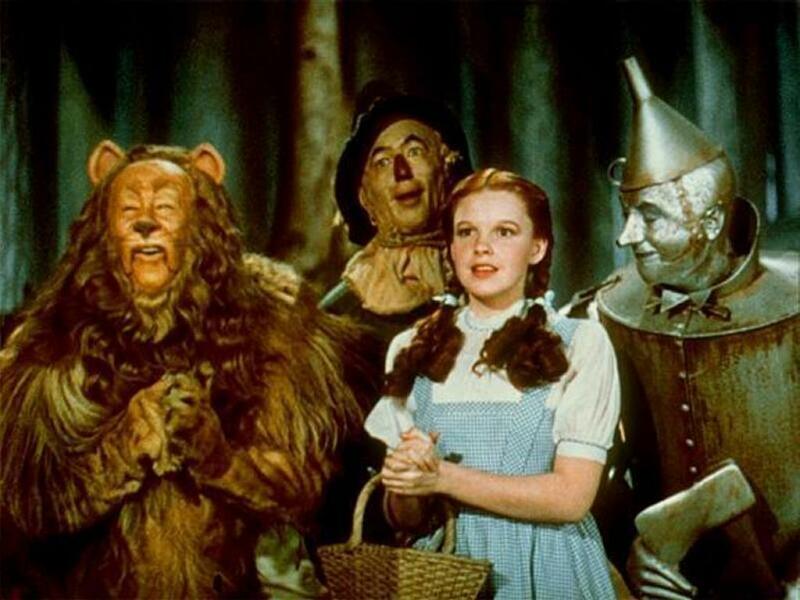 Bert Lahr as the cowardly lion really steals the show, and Jack Haley is adorable. There are many theories as to what this movie means to 1939-just beginning to recover from the Great Depression and gearing up for WWII. It must have been a nervous and uncertain time. I haven't fully made up my mind yet, but I think there are definitely some political and religious symbols. Perhaps after I read the book I will have a better background on what was added for the film. Please let me know if you were able to attend the event, and how you felt about it. The host, Fathom Events, is hosting another special event Thursday, October 8th. It is "Plan 9 from Outer Space", featuring an all-new MST3K commentary. I will be attending that one as well. To fin the nearest involved theater, check here. I've been putting off this entry for a while because I keep finding new things to add to my collection, so I tell myself "Wait until you get this in the mail". I realized today that collections will always grow, so now is the time to tell you about what I already have! I was raised going to Garage Sales ad Flea markets, always searching for a deal and enjoying the beauty and craftsmanship of older things. It's unfortunate that most of my generation would rather buy crap from Walmart than something well-made and already broken in! 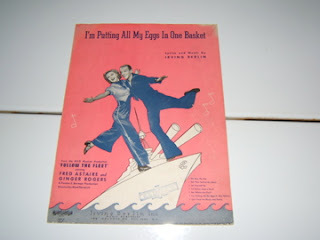 Sheet music was an important part of family entertainment through the 1940s. There was usually one person (often a young girl or mother) who played piano in each household. 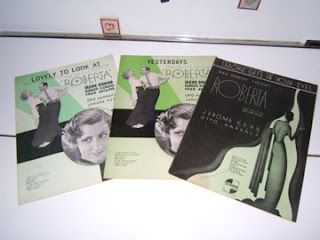 After seeing a picture, if you wanted to hear the music from something, buying the sheet music was your only option until the later introduction of LP soundtracks in the late 40s. With the advent of my classic film obsession came a classic film collection. 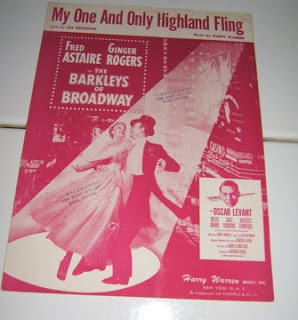 I began only getting sheet music at garage sales and flea markets, then gravitated to the dangerous eBay (dangerous because I spend too much money!). 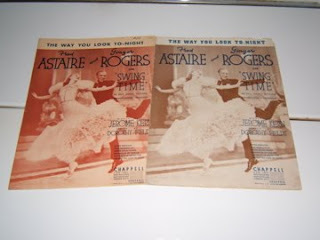 My goal is to collect every piece of sheet music from all 10 Fred and Ginger movies. By my estimation, I am about halfway through. I have 3 from "Flying Down to Rio", but my camera ran out of battery while I was trying to photograph them. I have 2 covers from Carefree, which are really special and will be descirbed at the bottom of the post! Including the Carefree covers, I am only missing one movie: the elusive Vernon and Irene Castle. I know there was some sheet music published for the film. I saw a piece once in an ebay lot that went for over $70-not worth it for one piece (except the piece at the end...:D). I may never find all the pieces from Vernon and Irene Castle, as the movie was not nearly as popular as their previous films. 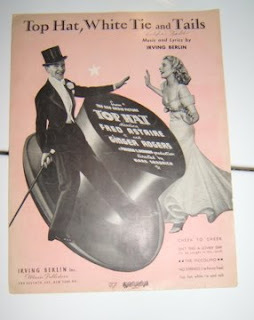 Also because it was more a dance film and a period piece, the music was not relevant to 1939 popular music styles. 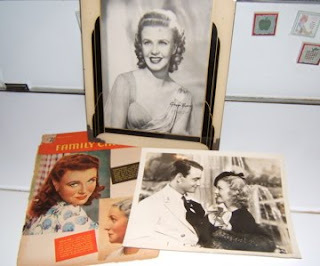 A cover of the Family Circle from 1940, an original framed picture of Ginger from Vernon and Irene Castle, and an original publicity still for "Don't Bet on Love". 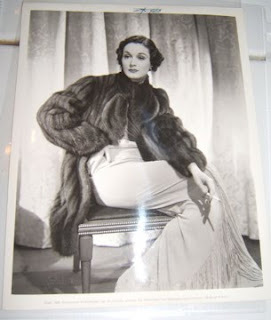 This lovely picture came from the personal collection of Gail Patrick! I went to an antiwue show this summer, and this guy had literally thousands of pictures of her that he purchased from her step daughter after her husband's death. There were also many large pictures of other stars-everyone from Cary Grant to Anna May Wong-autographed to Gail. Very interesting, and I love the back story. Now for the item to end all items! 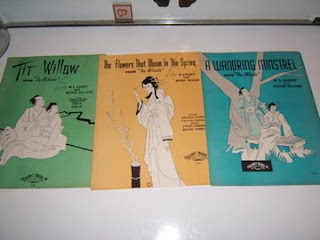 I am most proud of the sheet music I have collected from "Carefree", as it is the most rare (and beautiful!) 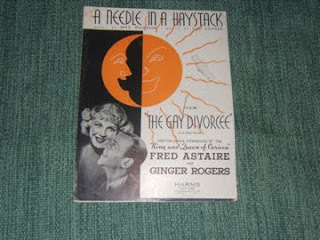 of the Fred and Ginger music I have so far. 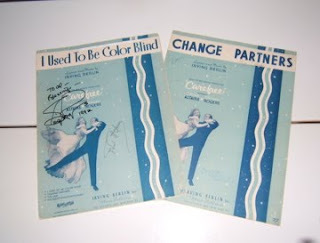 This is especially true of the music for "I Used to be Color Blind" because it's AUTOGRAPHED by BOTH FRED AND GINGER!!!!! I almost died when I found this on eBay. I ended up spending $70 on it, but I'm so happy I did. I'm having it appraised in a couple of weeks, along with an original poster from "Roxie Hart" which should arrive in the mail today. Look at the signatures-it's definitely them! Of course, that's only about half of my collection. I'll post more later.